The statue "Unconditional Surrender" on the Sarasota bay front has been mired in controversy since it's erection in Sarasota in 2005 as part of a public art program. 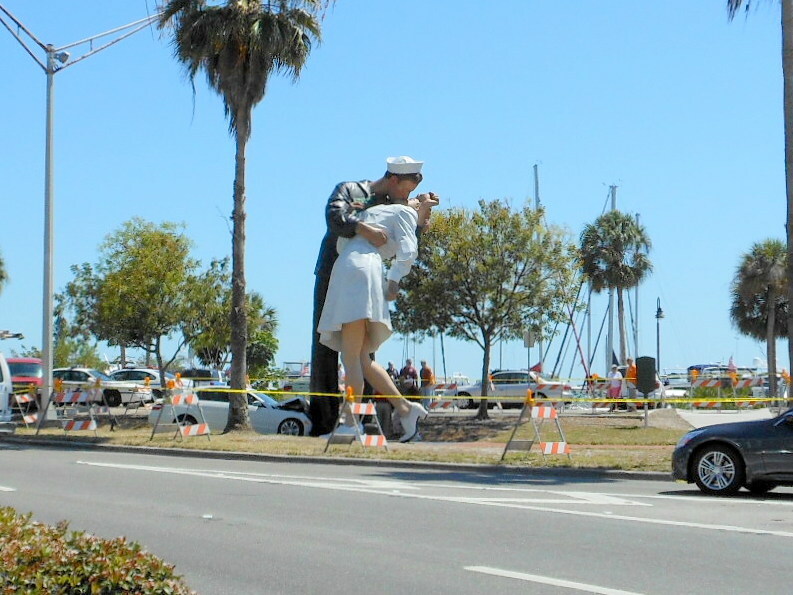 Scuffles over copyright issues, and as always with public art here the question "Is it really art? ", roils through the community. I personally don't think it is any more art, than an injection molded 6" Stature of Liberty" is art, but that's me. I think for many it provides a whiff of nostalgia of times, that in their minds were good, and anyone could grab a stranger on the street and give them a sloppy wet kiss. Do this today, and you will end up in the hoosegow, and get your picture in the paper. I had heard about this legal loophole in child labor laws some time ago. One day a year you can take children to work, and get some useful effort out of them. 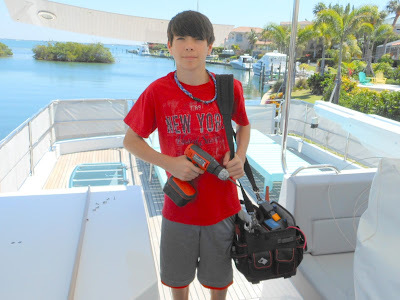 I was excited about the concept of having free labor, so when the "Take our daughters and sons to work" day came around, I wanted in on having a free worker for the day. Since Dylan Wood's parents weren't able to do this, I offered Dylan a chance to escape the educational gulag for the day, and he accepted. I have been looking for a very long time for a boat that has all of the design features that I feel are lacking in so many other boats from my perspective. 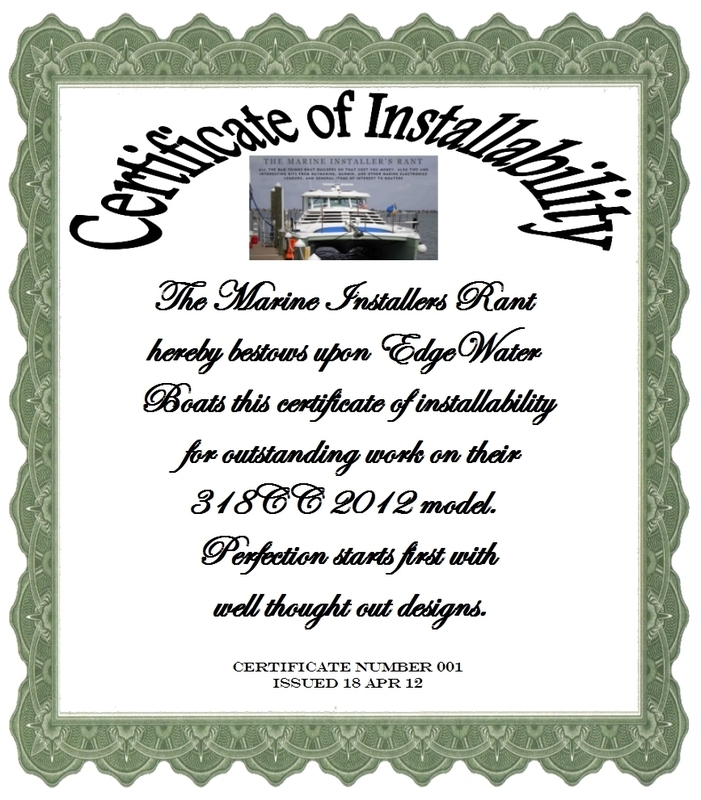 WTF maintenance, and installation moments are common in the production boat world, so it's truely refreshing I finally found one that is WTF moment free, the 2012 EdgeWater 318CC. I'm not reviewing the number of rod holders it has, whether it has a barbecue grill, how fast it can go, or how colorful the Naugahydes are. Instead I'm reviewing, as they say on Iron Chef, the bitter innards of the boat, and in this case they are very tasty. "Really, that's all I need, just the gateway kit, how much is it? Ouch $250 bucks? Well it is what it is, I guess, and the owner wants to see his engine instruments on his chart plotter." Fast forwarding a week UPS delivers me a box, and I go to the boat. Avidly ripping open the box, I behold the kit before me. There it is in all its glory, a small black box with an LED, and two cables coming out of it. Yep, one of them has a standard NMEA connector, and the other one has a what? It's a nine pin female connector, where the heck does this thing plug into? Wait a minute, it's a kit remember, and in the bottom of the box is another cable, with a nine pin male connector. I plug it in, and then look closely at the other end. Hmmm, it's a male 4 pin connector. Whats this plug into? I can see the entire engine harness, the engine gauges, the control computer, and the device bus, and nowhere is there someplace this four pin connector can go. Rats! "Hey, get that light out of my face." "Shut up and stay in that chair, or we'll cuff you to it. 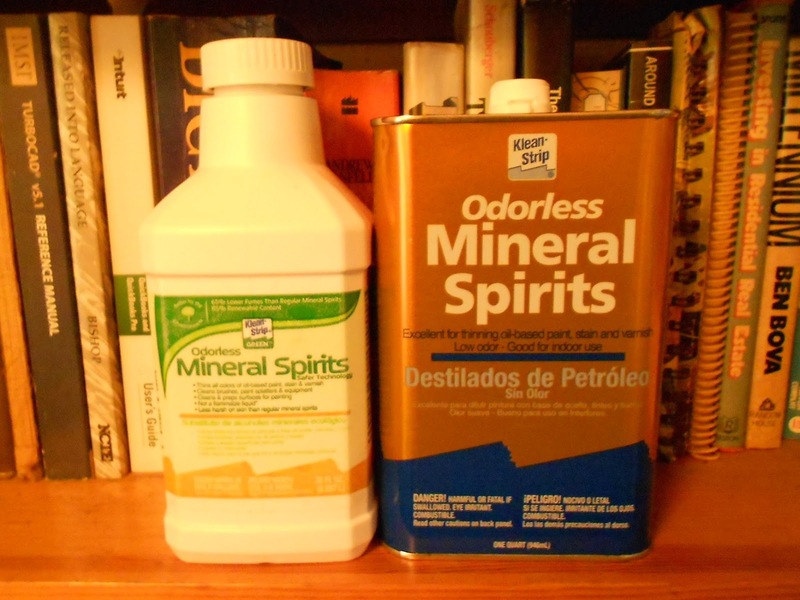 We have gotten complaints that you are impersonating mineral spirits." Can't you read detective? I am mineral spirits, look at my label." "I see your label buddy, but you could have printed that up with any computer. I know for a fact that real mineral spirits are clear. What's up with your milky color, and why do you have to be shaken before use?" "Hey do I look like some sort of a rocket scientist? I don't know, that's the way I was made. I'm special, greener, and better for the environment." "Whatcha mean you're green, does that mean you could be drunk, or poured into the bay?" "Whoa there, you can't drink me, or pour me into the bay. I can kill fish you know." "'Yeah? So what make you green then?" "Well for starters there are actually less solvents in me, maybe as low as 15% by volume and there might be as much as 40%, they don't tell me exactly how much. That makes me safer, and I want my lawyer, now! I ain't saying anything else copper." Gender bending, male or female? Lying deep within a mountain in the New Mexico desert is the clandestine headquarters of BIOS, the Bureau of Inanimate Object Sexing. Behind massive steel doors designed to protect good citizens from even accidentally overhearing conversations that are not suitable for pregnant women, children, and many others whose constitutions are of a frail and sensitive nature. Within these rooms, words like coupling, shrouds, hermaphrodite, bisexual, and androgyny are casually bandied around with impunity. Sexing inanimate objects is an important, but difficult and extremely taxing job. Because of the constant sexual pressure BIOS staff must always be carefully monitored by psychologists, and hand washing stations are always located close at hand for the safety of all.